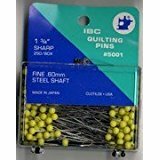 Which Permanent Markers for Quilts? I’m making a quilt to be used as a wedding “guest registry” by a friend. It will be a “couch quilt” after the wedding, used for naps, watching TV, etc., so it will be washed. This led me to wonder what type pen the guests should use to sign. Although a laundry pen would seem obvious, I ruled that out because it can be difficult to get it to move smoothly over fabric. That left Sharpies and Pigma pens as the primary contenders, and both are available in a variety of colors, which is nice. I’ve heard pros and cons regarding both, and when I asked a vendor at a show for suggestions, she expressed shock that I might use a Sharpie. I have to admit that I had doubts when I first read Mark Lipinski’s remark about using Sharpies to “fix” a quilt, years ago. However, I’ve tried them since and they’ve worked out fine. Mind you, I’m not concerned about archival quality, I’m concerned about the ease of use of the pen and how well the signatures will hold up to washing. Since I had both types of pen on hand, I made a couple of little quilt sandwiches, one with poly batting and one with cotton batting. I was concerned that either or both types of batting might absorb the ink and transfer it to the other side. Yes, these are the “after” pictures. 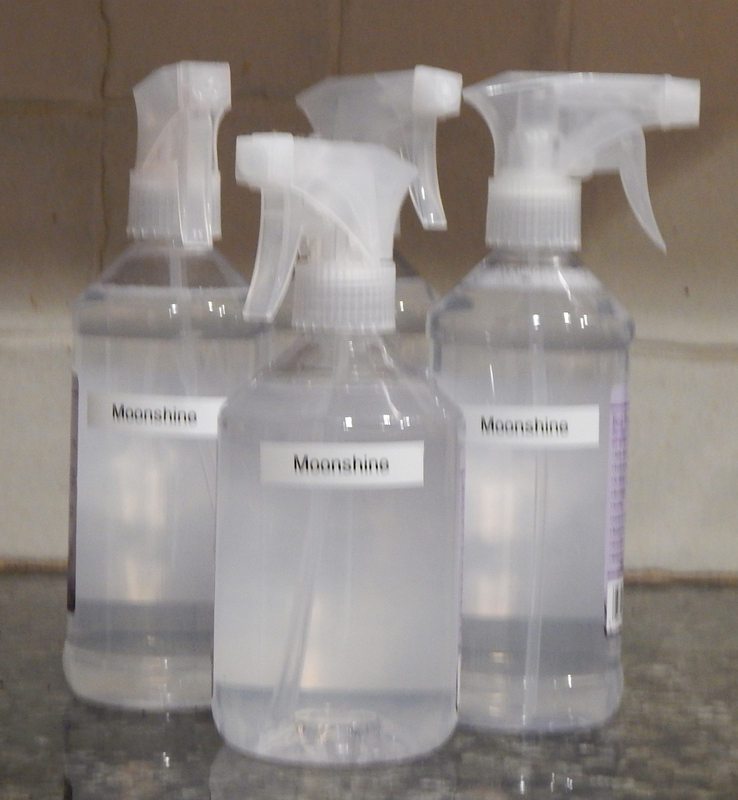 Both inks were essentially unchanged after washing and drying in cold water on the delicate cycle. 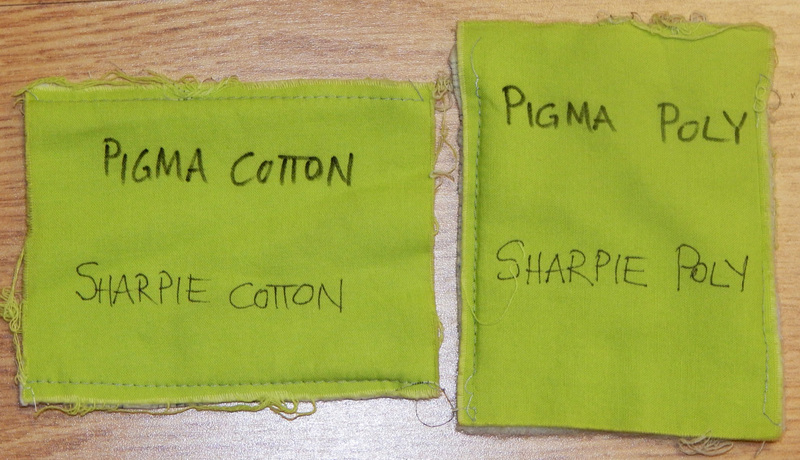 The pigma pen had a broader tip, so the mark showed up better both before and after washing. Neither pen bled significantly during writing, and neither soaked through the batting into the backing. Because Sharpies are easier to find, I’ll probably use those for guests to sign the quilt. And I’ll show the quilt to be used as a guest registry in a later post. Anybody out there have suggestions for permanent markers to be used on quilts? I have a great quilt studio with natural light and plenty of storage, but of course there’s always room for improvement! For starters, I was given a robot vacuum cleaner for Christmas! A while back, I got tired of having my main rulers “lost” on the cutting table all the time. 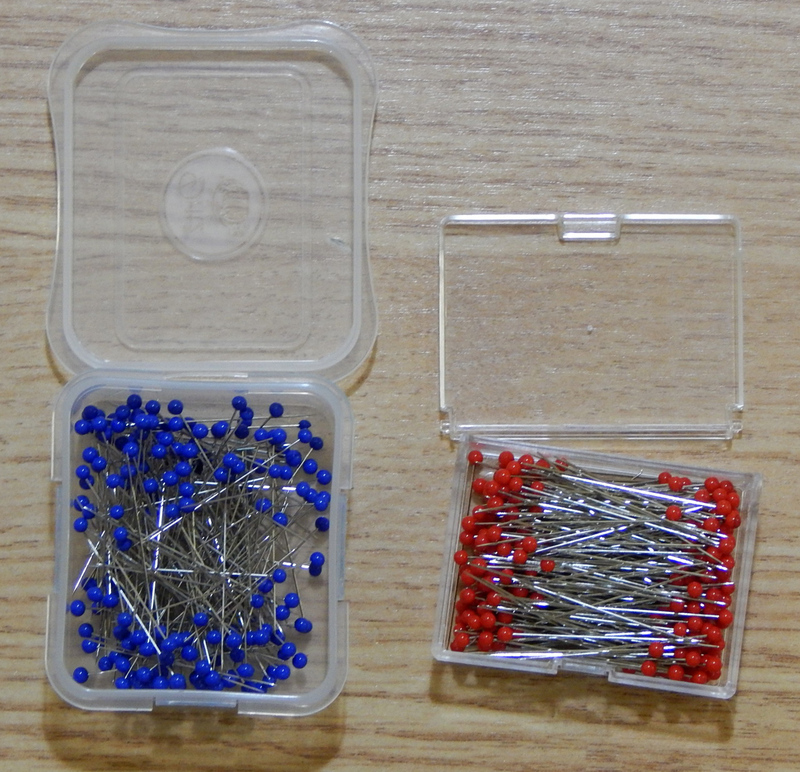 You probably know what I mean–always under the fabric, looking for the big one but find the little one, etc. 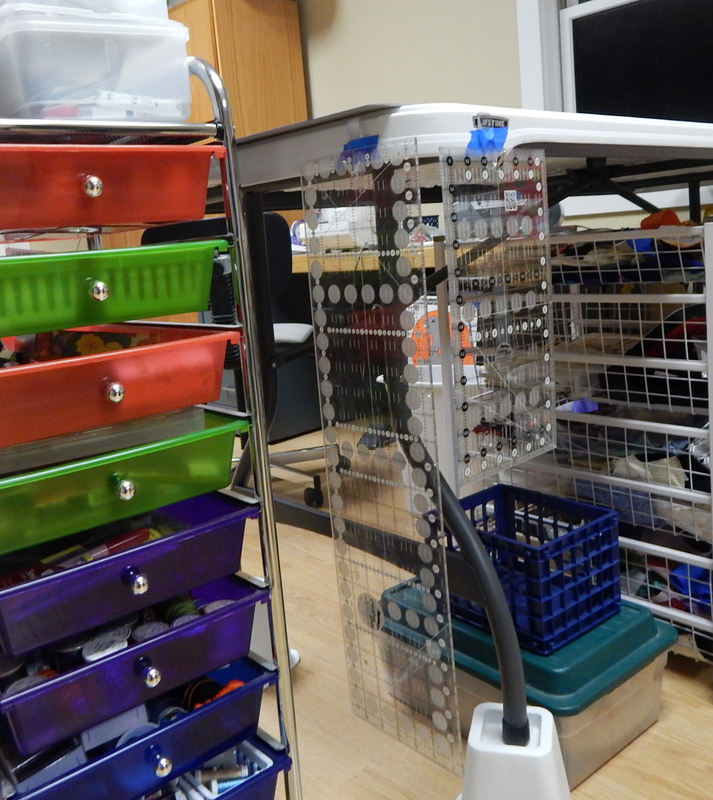 I didn’t want one of those ruler racks taking up space on my table, so I finally settled on attaching hooks to the sides of the table. The hooks have worked out well! For some reason, the manufacturer (these are Command hooks) thinks the hooks need to flip up and down, so they have tape over the part that would flip. However, they seem to stick to the table just fine, and now I always know where to find my rulers! My final “upgrade” is a new rotary cutter. I’ve been looking at the Martelli Ergo cutter for some time, wondering if it really is easier on the hands and wrists. Finally, one of my friends bought one and confirmed that it really does make cutting easier. She is left-handed, so was especially glad that it comes in a design specifically for lefties. I bought one of my own, and II agree that this is much easier to use than any of my standard rotary cutters. 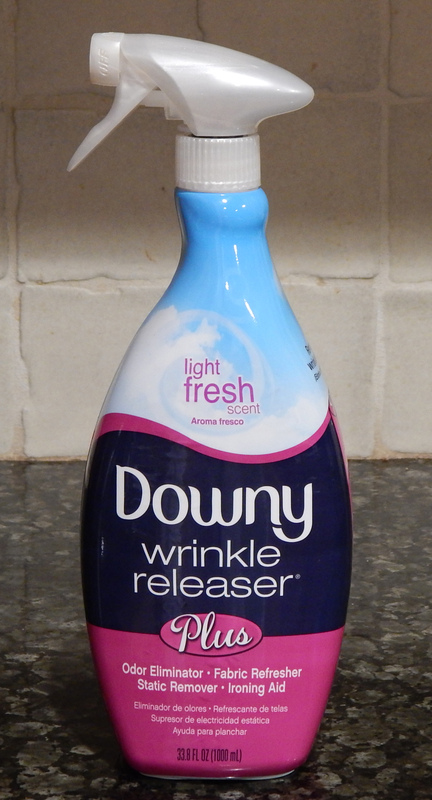 It makes for less strain on (aging???) joints and better control while cutting. 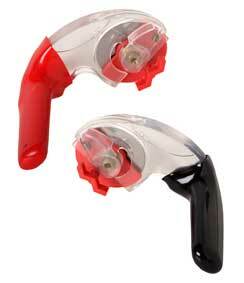 I can recommend this cutter without reservation. What’s new in your studio? 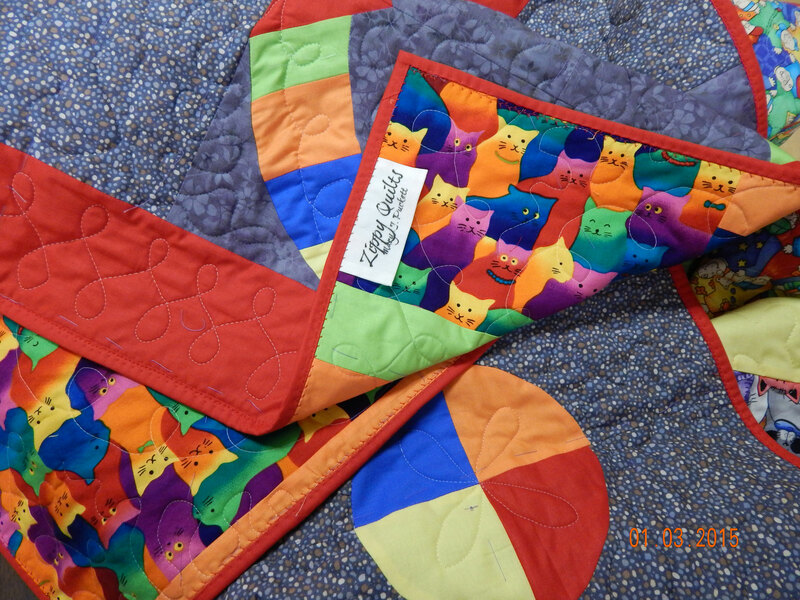 Karen Combs‘ Tumbling Blocks class, which I took at AQS-Chattanooga in September, was one of the best quilt classes I’ve ever taken. 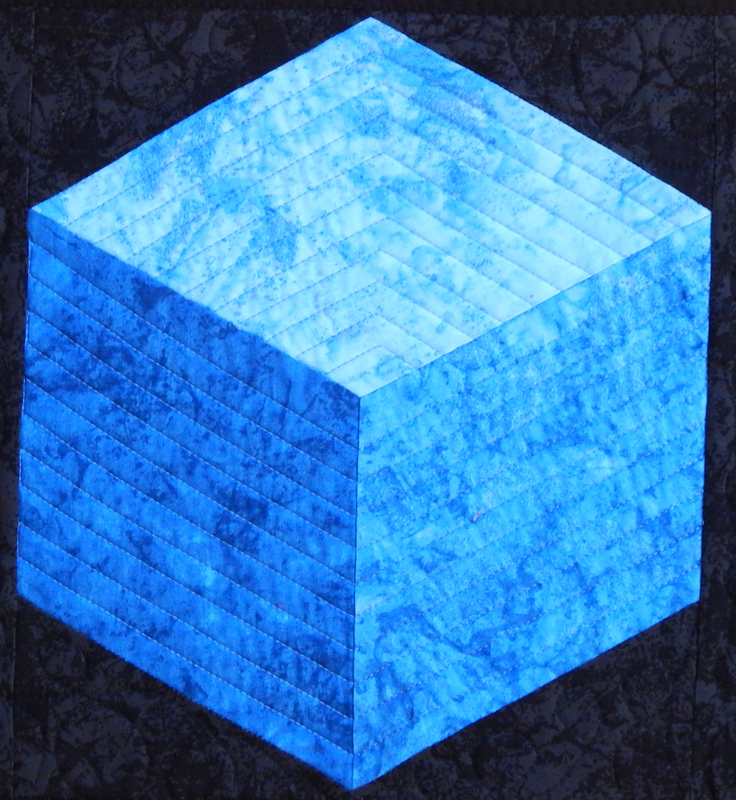 Of course, “tumbling blocks” is a traditional design, but I always like a challenge. Karen is so well organized and clear that I had 4 blocks made by the end of class and had started on the background! Her method for the Y-seams was so well explained that there is no need to even consider the “cheater” tumbling blocks made with half square triangles. One of the “secrets” to making this block easy is to buy ombre fabric that varies from dark to light in the same color, so you don’t have to hunt down 3 values of the same color individually! 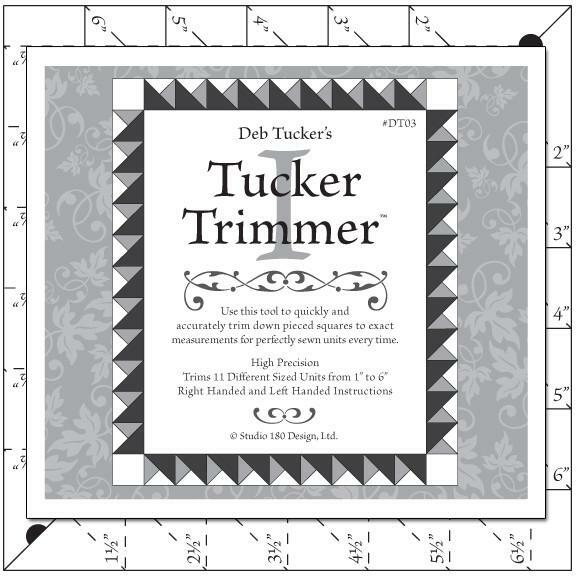 Of particular note, Karen showed us how to use a standard quilting ruler to cut the blocks–NO SPECIAL RULER REQUIRED! I think this is notable in a field where so many teachers are selling their own rulers, which are then needed for the way they teach a class. Karen’s class sample is a table runner, which probably does show off the blocks a little better than placemats. But I have more table runners than I can use, so placemats it is. 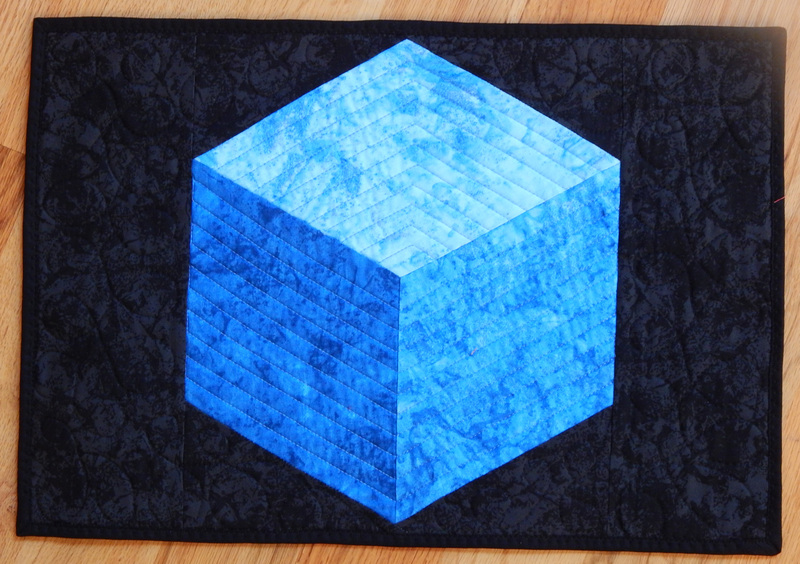 The quilting is done to emphasize the 3-dimensional aspect of the blocks, so I imitated what Karen had done. The background is quilted with random loops. I’m pleased with this project, and I certainly recommend you take Karen’s class if you have the chance! I decided to use Kraft-Tex as the bottom of a tote bag. There was a helpful video on You Tube (of course!) showing how to use it and showing what it looked like both washed and unwashed. Because I didn’t want to wash the drapery fabric I was using for the bag, I didn’t wash the Kraft-Tex. The Kraft-Tex was very stiff right out of the package, so I wadded it up hoping to soften it a little before folding it to make the bag bottom. I didn’t really need to do that; it folded and sewed very nicely. It remained extremely stiff but was not at all difficult to stitch with my Bernina, even when it came to sewing through 4 layers as I boxed the bottom of the bag. When I got it all put together it provided a nice substantial bottom for the bag, as I had hoped. It did not even THINK about tearing like paper when I was working with it. 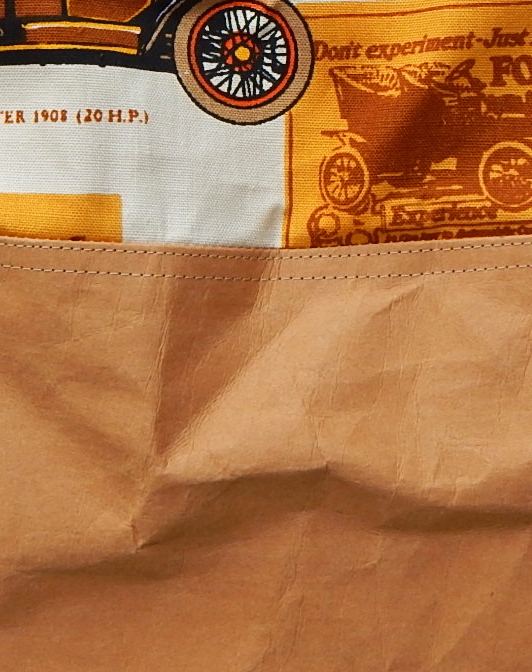 However, I really think it LOOKS like a brown paper bag rather than “like leather” as advertised. Maybe that’s just because I used it to make a bag. As you can see from this detail, it did stitch very nicely. 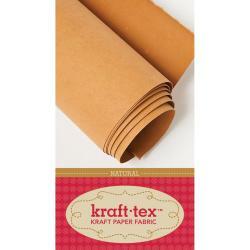 However, the claim that Kraft-Tex “handles like fabric” was absolutely untrue! It was so stiff that I decided to wash what remained along with the rest of the drapery fabric. Both washed and dried well on gentle cycle, and the Kraft-Tex was slightly softer after washing. It didn’t handle any more like fabric, though–turning that stiff outer bag through the opening left in the lining for that purpose was “challenging”! 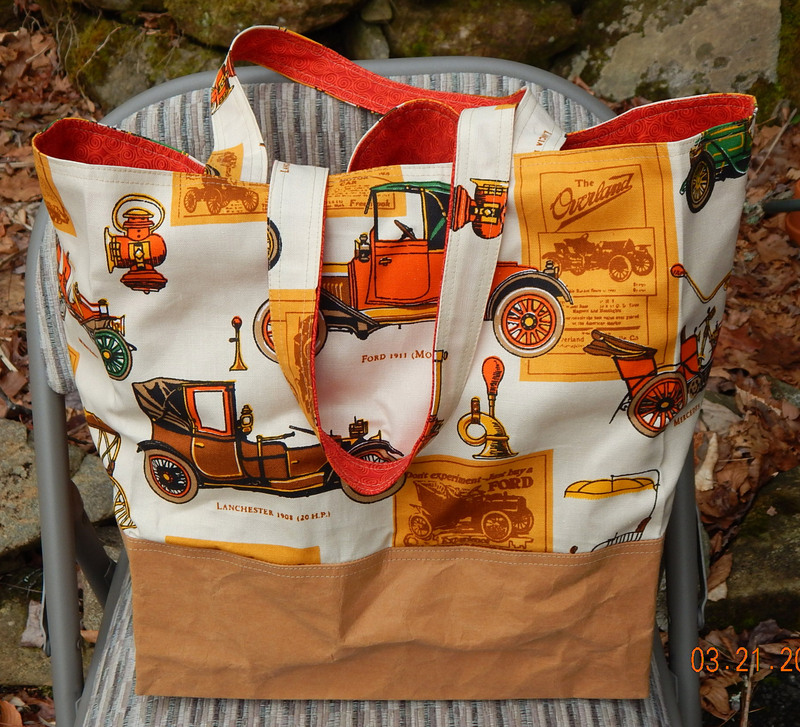 Here’s the second bag, made with washed Kraft-Tex. Sure enough, it looks the same after washing. I quilted the upper part of the bag, which gave it more substance than the previous one, so it went better with the stiff Kraft-Tex bottom. The pattern I used for this bag was free at Bijou Lovely and was very well written and illustrated. 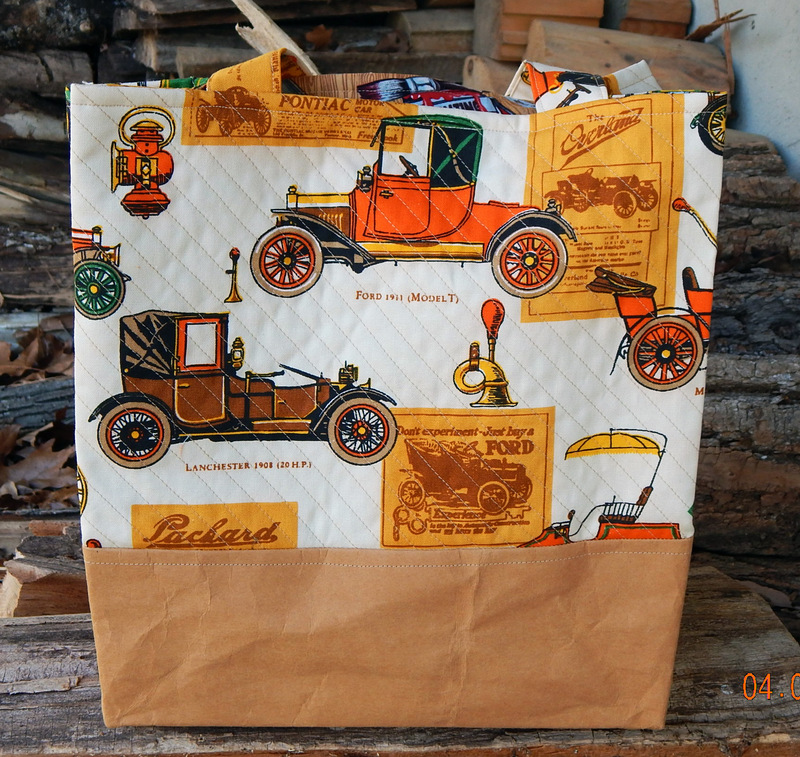 I’ll probably make the bag again, but I’ll find another use for the Kraft-Tex! Inspired by the beautiful Metro Hoops quilt Allison showed over at Cluck, Cluck, Sew, I mentioned the Quick Curve Ruler as something I wanted to try in a recent post. Here’s a picture of her quilt so you can see what inspired me. My clever son-in-law gave me the ruler for Christmas, and as soon as we got home I tried it out. As always, I learned a lot. 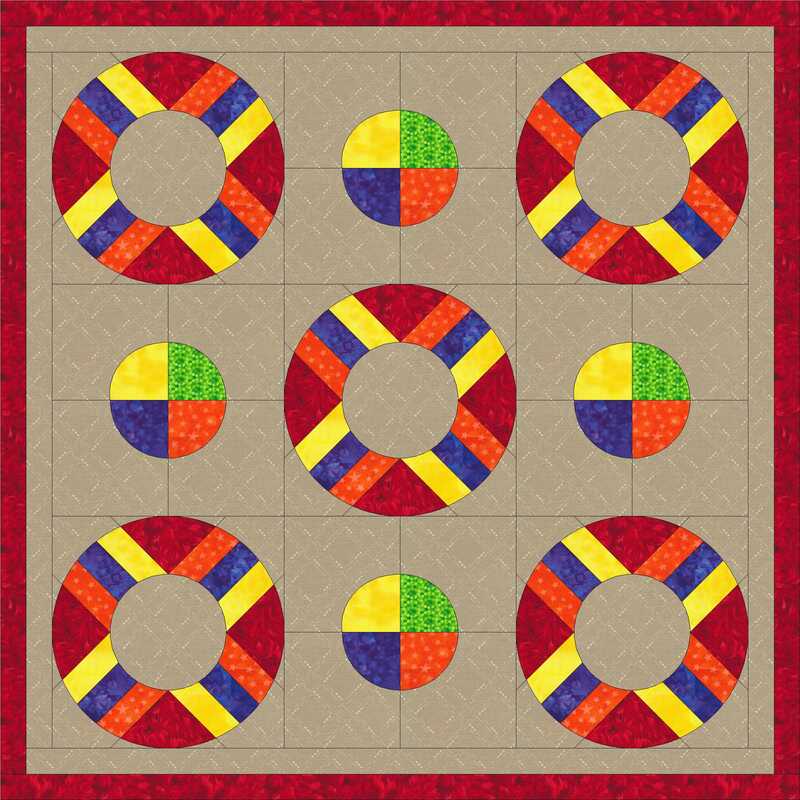 Certainly the Metro Hoops pattern is a nice modern alternative to the traditional wedding ring quilt. What I wasn’t prepared for was the fudge factor required to make it work. Luckily, I almost never cut out a new quilt completely before making a test block. 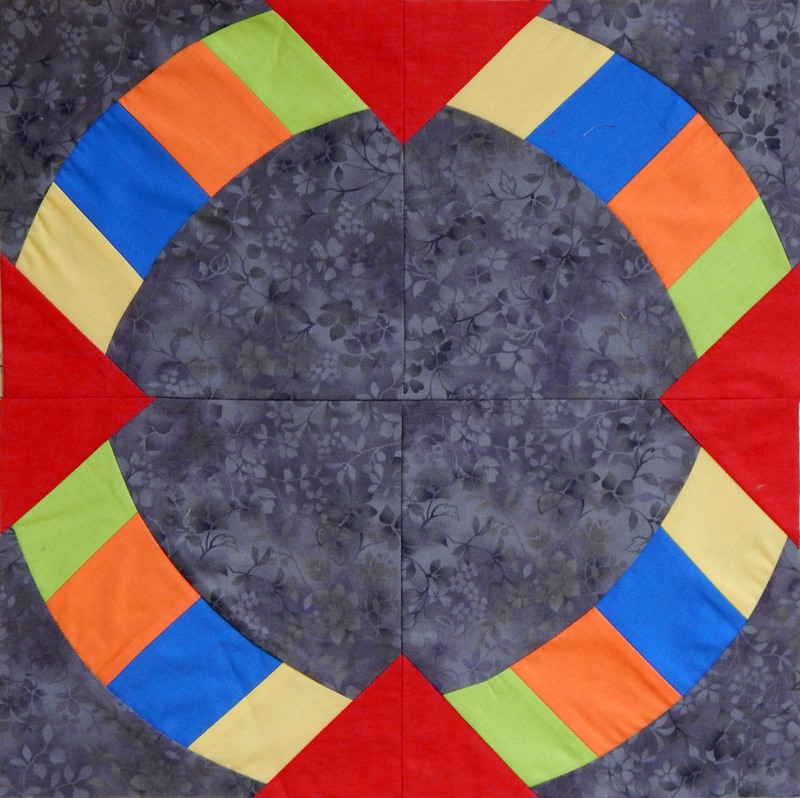 After making one block for this quilt, I decided 5 hoop blocks was my limit. 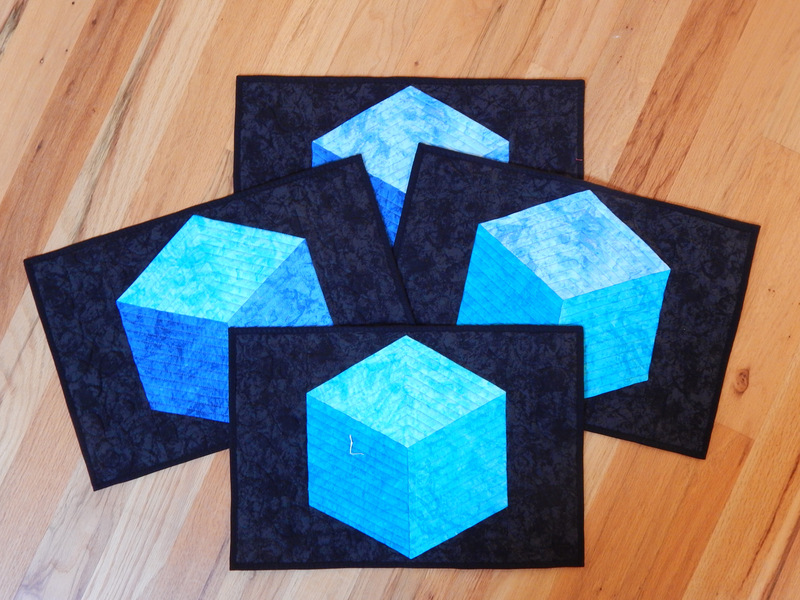 The blocks really are quicker and easier to make than they look, so I got the 5 done in a few hours. They are nice big blocks (finish 15″) so I had a good start on a baby quilt. 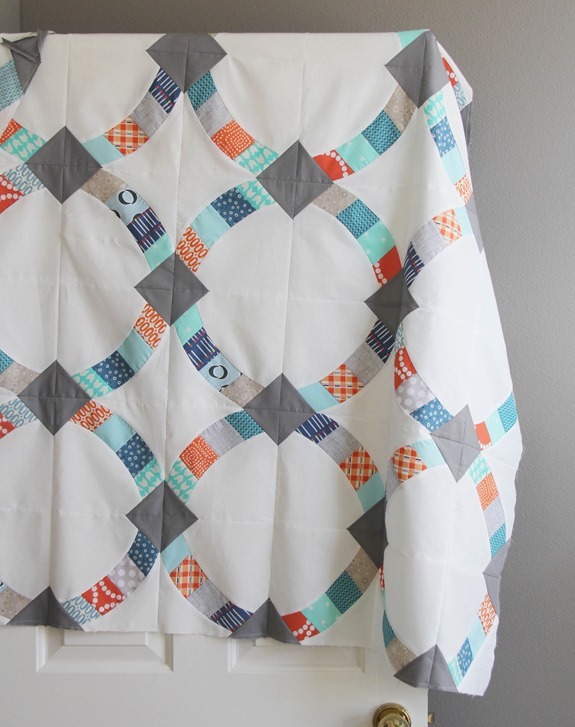 Another half day to make the alternate blocks, then a day to put it together, make a back, and quilt it–and voila! The first finish of 2015! 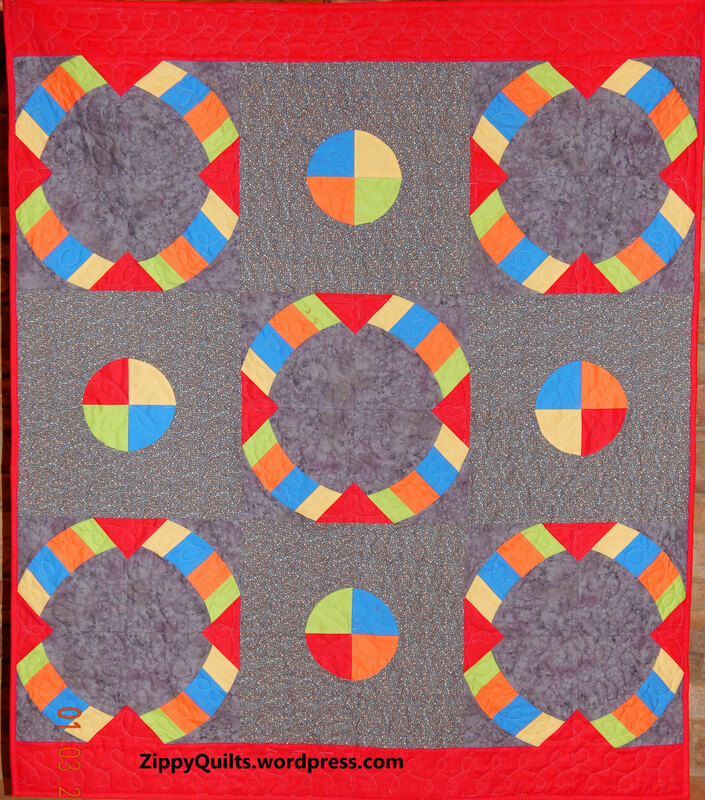 About the Quick Curve ruler: the women who designed it have lots of cute quilt patterns on their site, so it’s worth checking out. *BUT, if I make metro hoops again, I’ll modify the directions to make it more to my liking. I think the basic issue here is that the single curve provided by this ruler is used for both the concave and convex curves in the quilt. That means there is no seam allowance to make the curves match nicely. The project is “saved” by the fact that the curve is less than a quarter circle, so it’s possible to fudge the sewing to make it go together without adding seam allowances. It does work, but don’t think it’s going to fit the way pieces cut from most curved templates do. 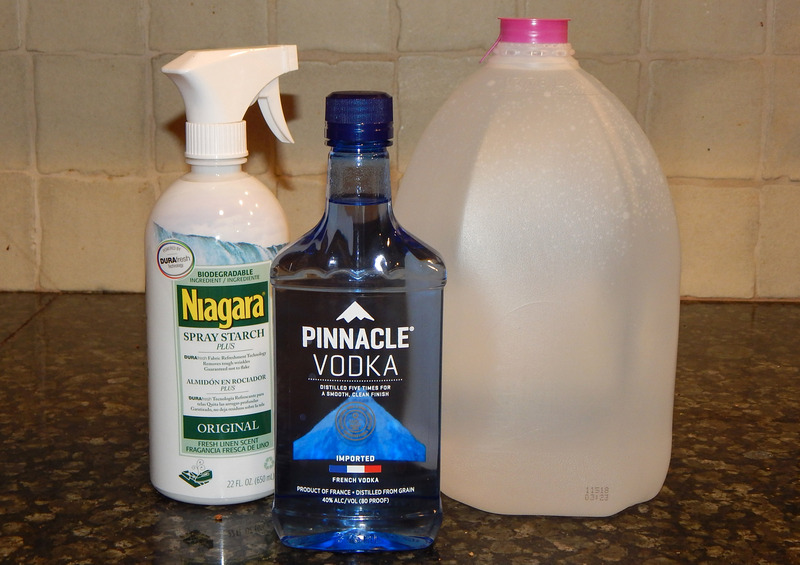 If you decide to do it, be forewarned to relax and get rid of the inner perfectionist!